Welcome to Bangkok, the City of Angels, and welcome to the River of Kings, the Chao Phraya River. A number of beautiful attractions can be found at the numerous piers along this historic waterway . 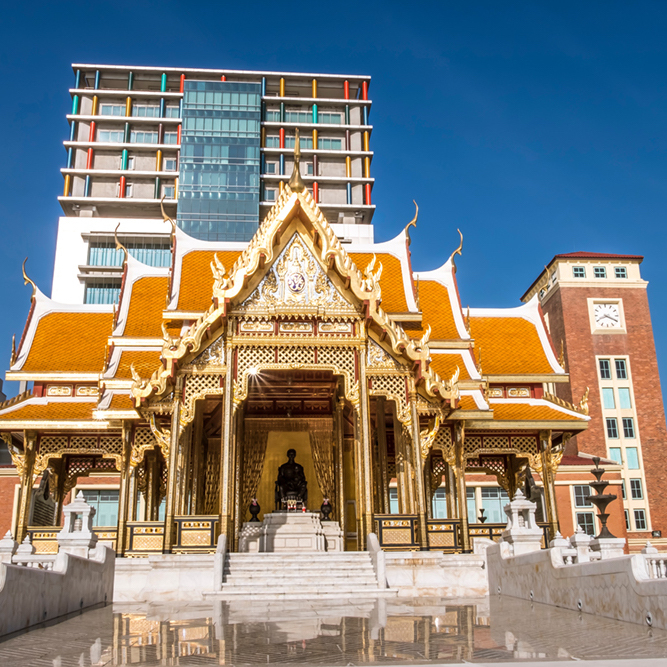 From the magnificent Temple of Dawn to the fascinating Museum of Siam and from the vibrant flower market to the spectacular Grand Palace, Throughout this section, we will tells you what to see, where to go and, perhaps most importantly, how to get there using the Chao Phraya Tourist Boat. Useful information, travel tips, departure times and where to try some delicious Thai delicacies will also be provided. 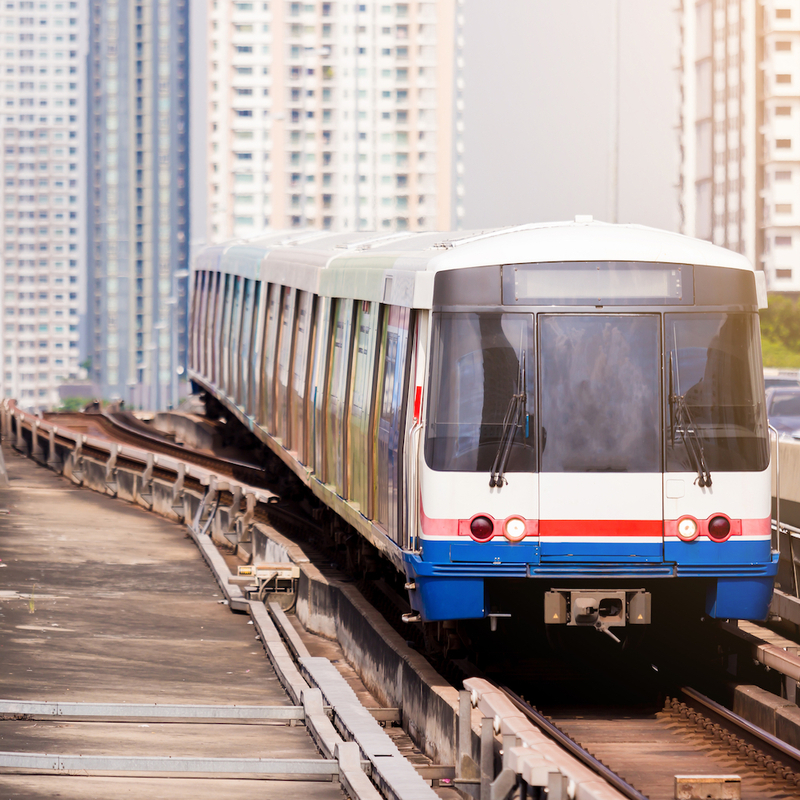 Saphan Taksin BTS Station (S6) is the BTS skytrain station on the Silom Line which connected to Sathorn Pier. To get to the pier, take exit 2 and go down the stairs. Walk through the pathway, turn left and take some steps. You will see the blue ticket booth in front of you. Visit the ancient temples of Thailand built in the Ayutthaya period (about 242 years ago). See the architecture of the pagoda. "Junk boat" was built in the reign of King Rama III to show the generations, to remember the Chinese junk ship used in the Thai trade with China. Getting there: From Sathorn Pier, walk straight to the main road about 300 meters and turn right, then straight about 100 meters to find the temple on the right. Opening Hours - 07.00 - 19.00 hrs. การเดินทาง: จากท่าเรือสาทรเดินตรงไปที่ถนนใหญ่ประมาณ 300 เมตร แล้วเลี้ยวขวาเดินไปประมาณ 100 เมตรจะเจอวัดอยู่ทางขวามือ เวลาเปิด-ปิด 07.00 – 19.00 น.
ICONSIAM, a spectacular global destination on the Chao Phraya River, offers the best Thai and luxury brands around the world. The unrivalled components are the greatest in a complete range of products and services bringing together 500 retailers who offer from every corner of the world. It also provides world-class entertainment and dining aesthetics offering a 3-Michelin star restaurant and more than 100 of the world's famous restaurants. Travellers can enjoy the multi-media water-and-fire spectacle along the 400-metre stretch of the Chao Phraya River. 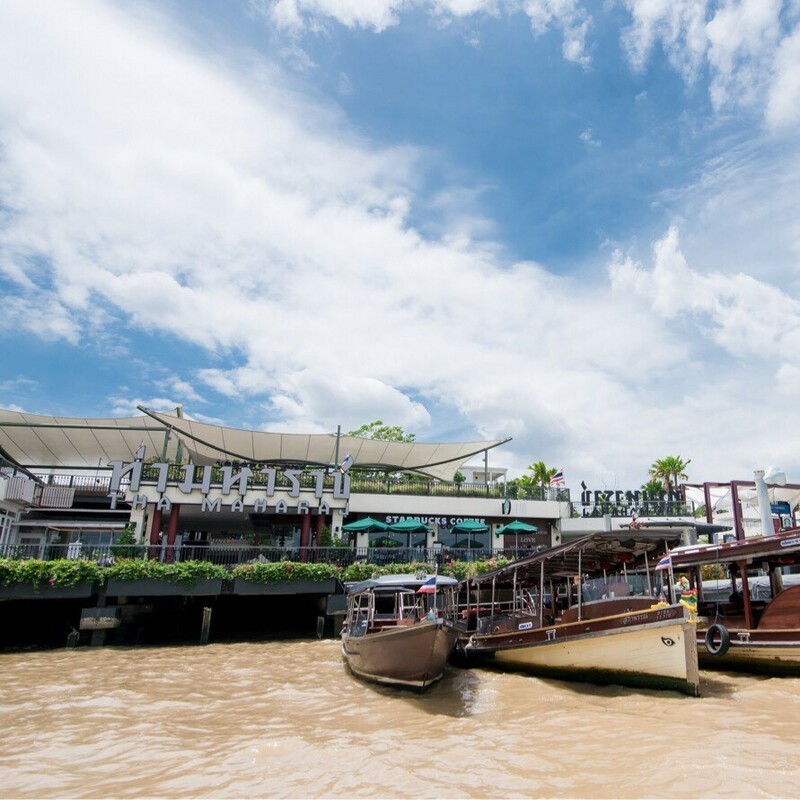 There is also an exciting experience at the first indoor floating market as well as impressive and enjoyable services found only in Thailand along with rare art and cultural performances within an over 8,000-square-metre area. ไอคอนสยาม เป็นศูนย์การค้าระดับพรีเมี่ยมริมแม่น้ำเจ้าพระยาที่รวมสินค้าจากทั่วไทยและสินค้าแบรนด์ดังจากทั่วโลกมากกว่า 500 ร้านค้า นอกจากนี้ยังมีภัตตาคารหรูระดับมิชลินสตาร์ 3 ดาว และร้านอาหารที่มีชื่อเสียงคุณภาพพรีเมี่ยมจากทั่วโลกกว่า 100 ร้านให้ได้เลือกรับประทานกันอีกด้วย และยังสามารถชมการแสดงระบำสายน้ำประกอบแสงสีเสียงยาวที่สุดในเอเชียตะวันออกเฉียงใต้ ‘ICONIC Multimedia Water Features’ (ไอคอนิค มัลติมีเดีย วอเตอร์ ฟีเจอร์) ผสมผสานแสง สี เสียง สุดยิ่งใหญ่ตระการตาที่มีความยาวถึง 400 เมตร จัดแสดงโชว์ให้ได้ชมกันทุกวันในเวลา 18.30, 20.00, และ 21.00 น. เวลาเปิด-ปิด : ไอคอนสยามเปิดให้บริการทุกวัน ตั้งแต่เวลา 10.00 - 22.00 น. Enjoy shopping, tasty food, and snacks, alongside traditional "Ewe Guay" which have been available here for more than 20 years. There are a variety of fillings for this special treat: cabbage, bamboo shoots, garlic chives, and more at 10 Baht per piece. Sample a few, fill up for the day. There is also a sweet dessert to try; "Bua Loy" naturally colorful due to a mixture flour with pumpkin, or your choice of butterfly peas, carrots, pandan or beetroot with a sweet and aromatic coconut milk. Adding sweetened eggs or salted eggs make it equally as delicious. Getting there: Exit at ICONSIAM pier and walk to the right. 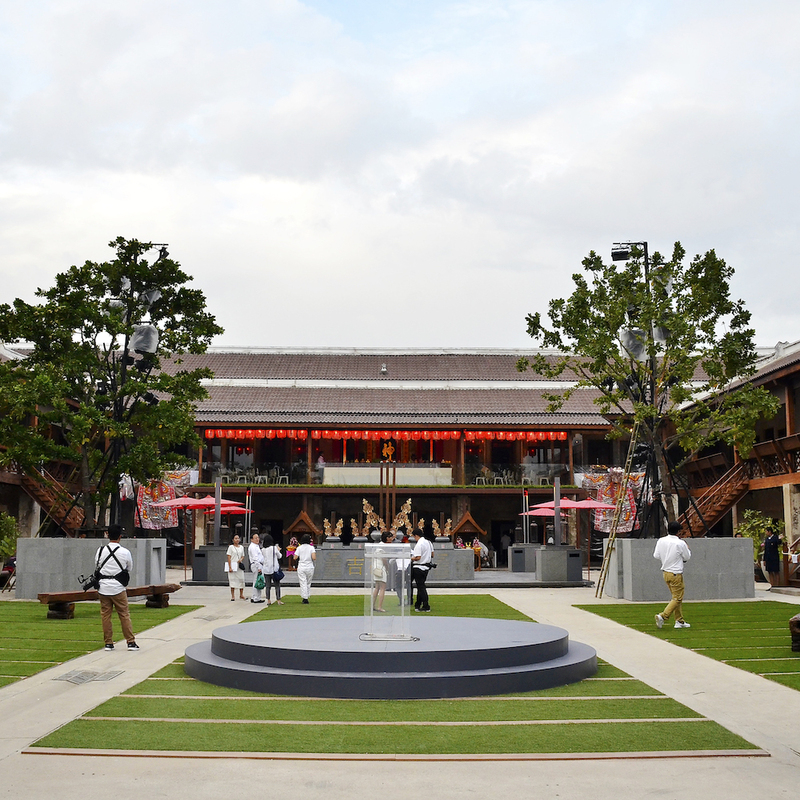 There you'll see Khlongsan Plaza; it is open from 5:30 - 21:00 hrs. การเดินทาง: ลงท่าไอคอนสยาม เดินไปทางขวาสังเกตป้าย Khlongsan Plaza เปิดตั้งแต่ 5.30 – 21.00 น.
LHONG 1919 was constructed in the Chinese architectural style called “Sān Hé Yuàn”. The buildings form one integral U-shaped complex, with an open courtyard designed according to the Feng Shui belief regarding the connection between heaven and earth. The main building facing the river, houses MāZu Shrine. MāZu is the goddess of the sea, protecting fishermen and seafarers. Here at LHONG 1919, there are three wooden figures of MāZu at different stages of her manifestations that were escorted over from China over two hundred years ago. 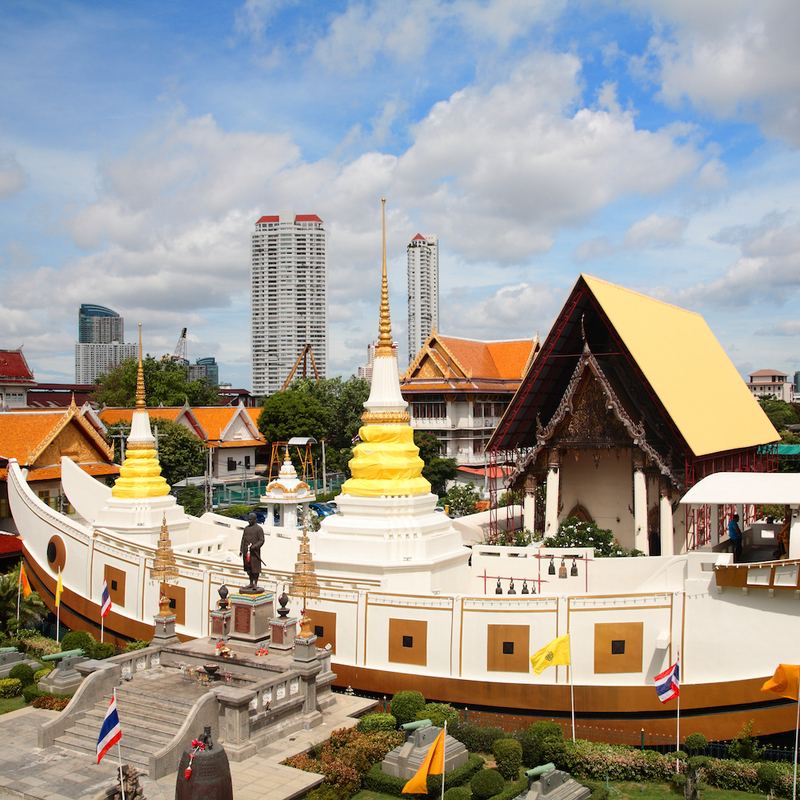 Wat Mangkon Kamalawat (also referred to as Wat Leng Nei Yi) is one of the famous temples in Bangkok. Not only appealing to the eyes, this beautiful place has been built for more than 147 years. The architecture is one of southern Chinese style. 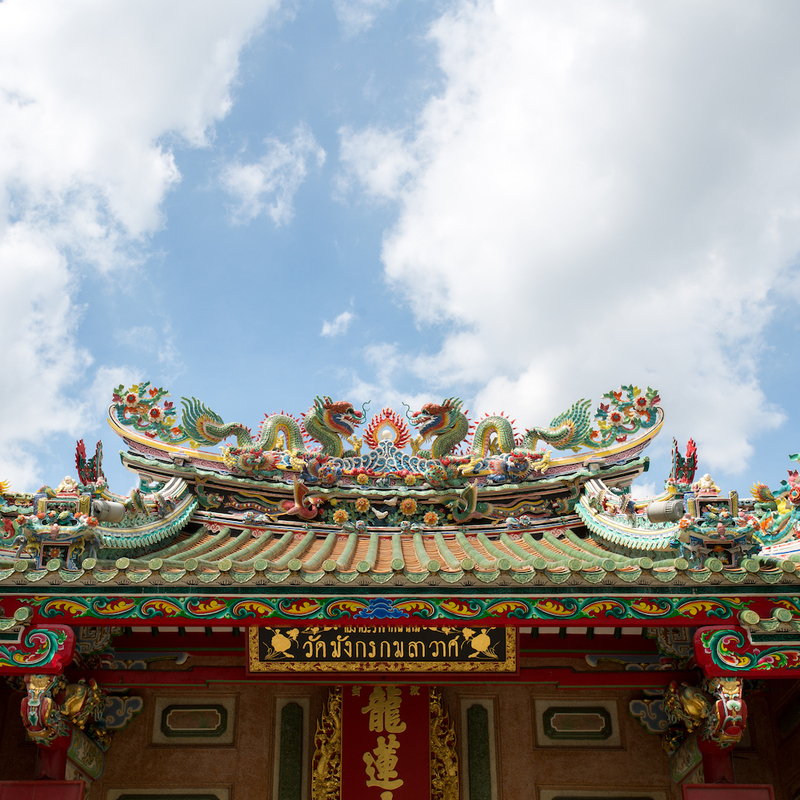 Not only can you enjoy the beauty of this temple, but this is also where pilgrims, both Thai and Chinese, always frequented and prayed for blessings at. As for anyone who wishes to exorcise their sins and change the bad fortune bestowed upon them according to their zodiac for the year, they may do that here. This temple welcomes visitors daily for this very purpose. The doors are open every day from 6:00 to 18:00 hrs. Getting there: When exiting the boat at Ratchawongse Pier, walk straight to Charoen Krung Road and turn right. From here, walk straight until you find the Thanon Mangkon (Dragon Road) intersection. Turn left. The temple will be in the right alley. วัดมังกรกมลวาส หรือ วัดเล่งเน่ยยี่ เป็นหนึ่งในวัดดังของกรุงเทพมหานคร ที่ถูกสร้างมานานกว่า 147 ปี ออกแบบสถาปัตยกรรมแบบจีนตอนใต้ นอกจากจะได้ชมความสวยงามของวัดแล้ว ที่นี่ยังเป็นที่ที่นักแสวงบุญทั้งชาวไทยและชาวจีนต่างแวะเวียนมากราบไหว้ขอพรกันอยู่เสมอ ส่วนใครที่อยากจะสะเดาะเคราะห์แก้ปีชงก็สามารถเข้าไปทำพิธีด้านในได้ ซึ่งทางวัดเปิดให้สะเดาะเคราะห์แก้ชงทุกวัน ตั้งแต่ 6.00-18.00 น. This area is heavily populated by Chinese-Thai people. 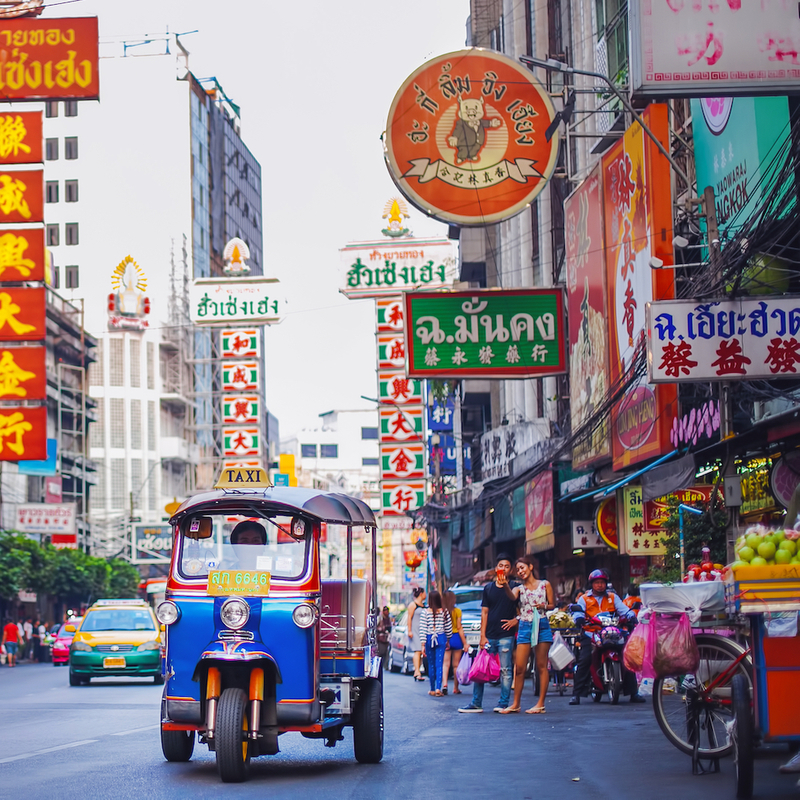 The Chinatown trade area has been around for more than 100 years, serving as a business district and offering gold shops, restaurants, small vendors as a major tourist attraction of Bangkok. Also known for being the road that never sleeps. because it is filled with a variety of shops and delicious restaurants. For those with a taste for street food, this place is most recommended. Local street food includes Thai and Chinese, and seafood, desserts, and fruits. Any and all tastes can be found here. FYI, several shops on this road are closed in Mondays so it may be a little quiet then. 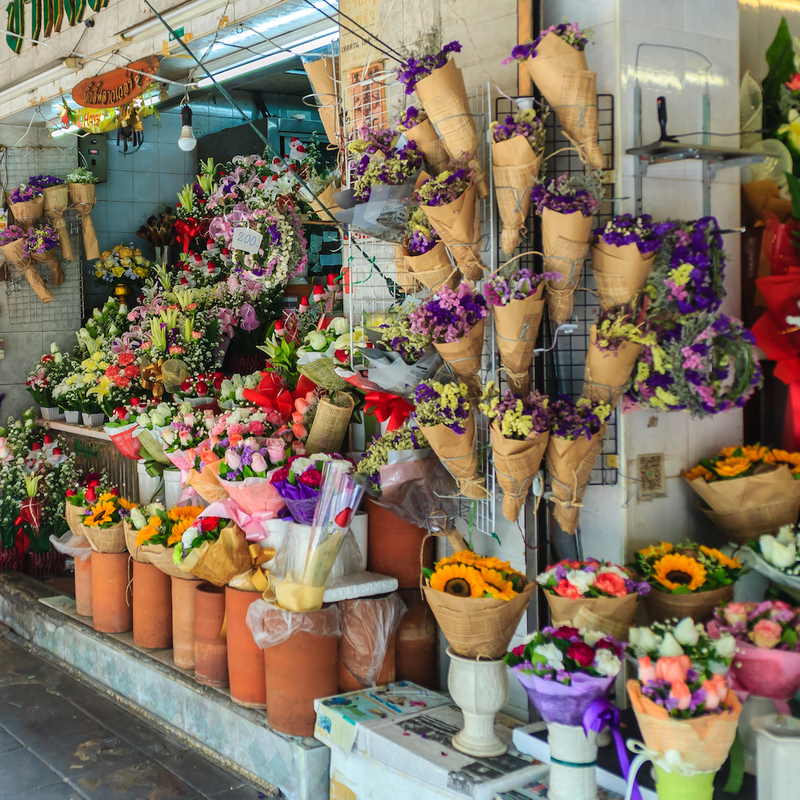 Visit this atmospheric flower wholesale market in Bangkok to purchase beautiful flowers for loved ones. Or find a pretty spot to take pictures. If you want to take a photo of the Chao Phraya River, walk up the Memorial Bridge to take in the beautiful scene once more. Getting there: Exit the boat and turn right. On the left, you can't miss the market. The first discovery museum which was created in a novelty way that encourages playing and learning. It presents stories through modern technology, making it appealing and accessible to visitors. There are techniques as part of the story causing interactions with visitors. The new permanent exhibition, “Decoding Thainess”, is exhibiting to show the development of “Thainess” from past to present. There is also a corner to learn about Thai history; beliefs, education, dress, food, etc. If you stop by here one time, you will see and and explore Thailand with a fresh perspective. 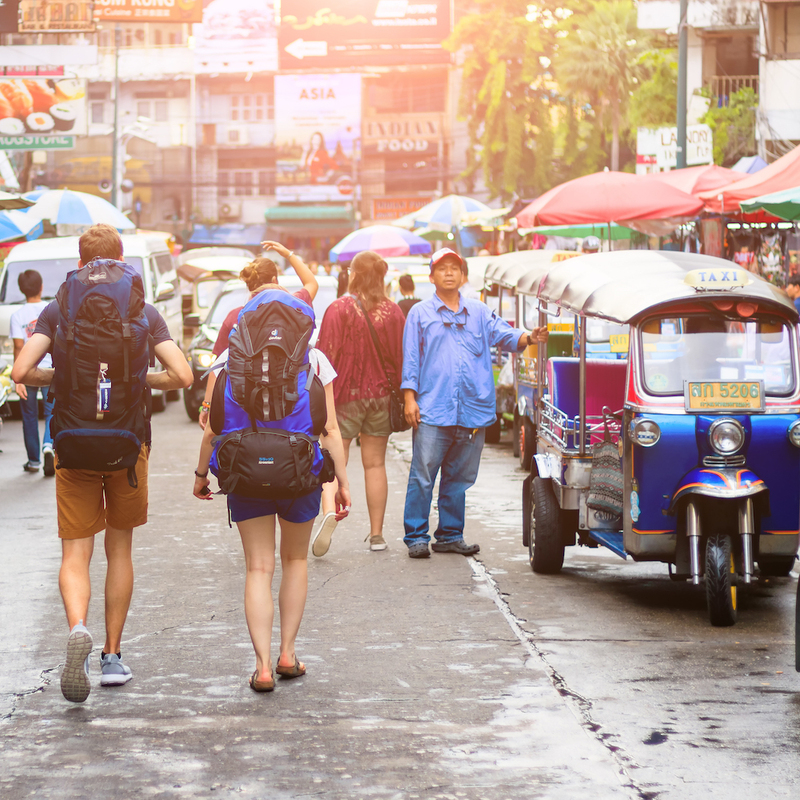 Getting there: Hop off the boat at Pakklong Taladd (Yodpiman) Pier and walk through the flower market to the street, then turn left and go straight toward Sanaamchai Road. The museum is on the left. Opening Hours: Tuesday – Sunday 10:00 – 18:00 hrs. เวลาเปิด-ปิด : เปิดให้บริการทุกวันอังคาร - อาทิตย์ (ปิดให้บริการทุกวันจันทร์) เวลา 10.00 – 18.00 น.
Marvel at the beauty of Thai architecture built during the Ayutthaya period, some 700 years ago. 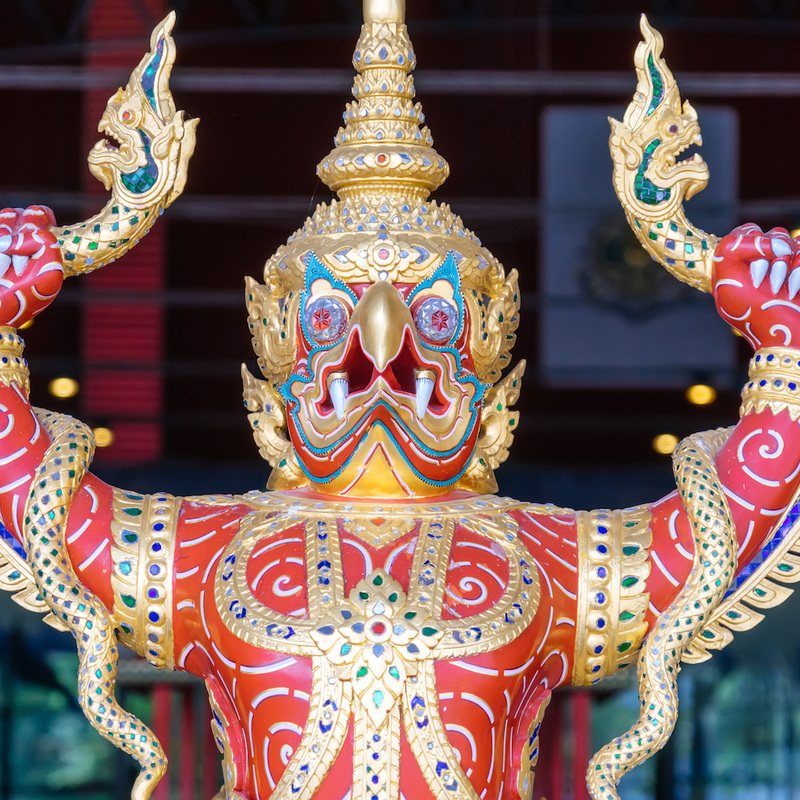 Take a picture with the "Giant Guardians", unique to Wat Arun and located at the entrance of the chapel. These two statues are Sahatsadecha and Tosakan and have stood guard here for a long time. 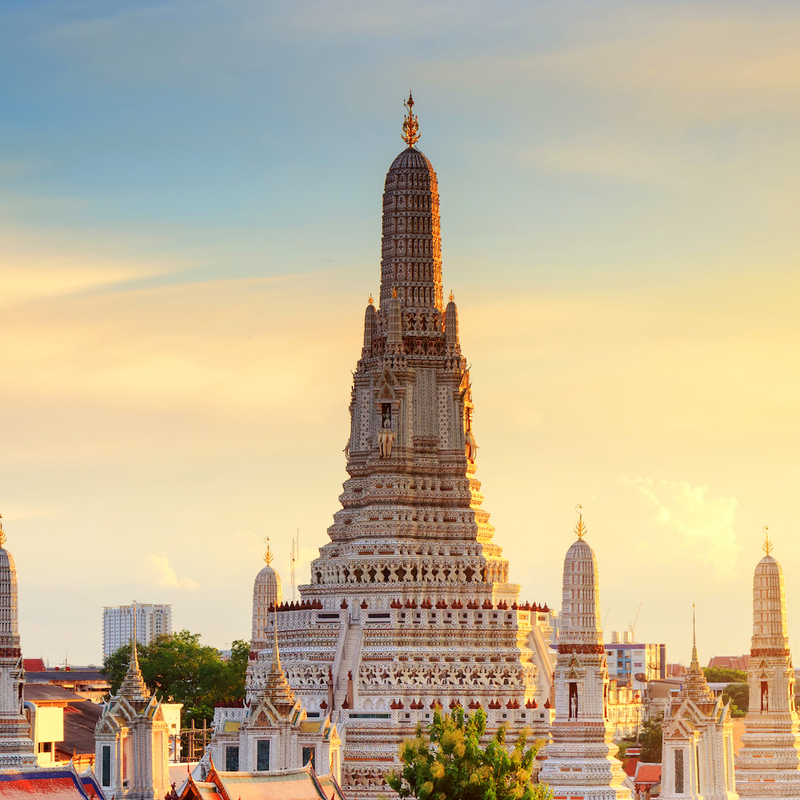 Discover also the principal pagoda of Wat Arun, another important symbol for all tourists to see. It is an ornate structure which measures 81.85 meters in height. Dress Code: Dress politely, not in tank tops. Wear pants, or shorts/skirts past the knees. Watch the beauty of Wat Phra Chetuphon (known locally as Wat Pho). This temple is a registered World Heritage from UNESCO. 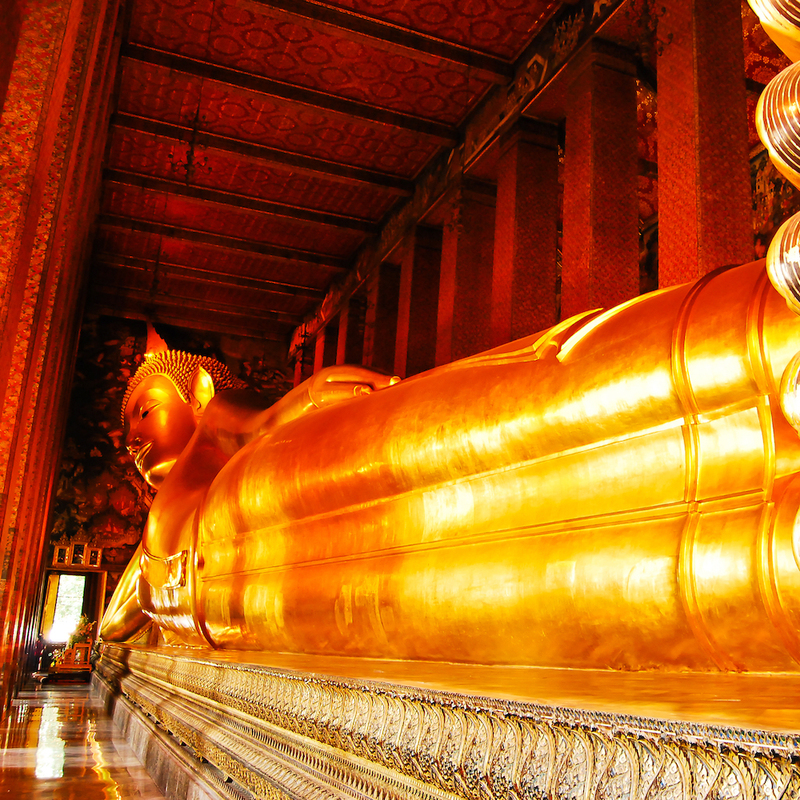 Here you can behold the beauty of the magnificent reclining Buddha enshrined in the temple. Pearls decorate the feet and eyes. This sleeping depiction of Buddha symbolizes the passing into nirvana. Being of immense historical significance, this Buddhist monument is invaluable. One of the highlights of this location is the chance to get a traditional Thai massage, and it comes highly recommended. There are massage therapists and traditional medicines to rejuvenate oneself, further making this spot worth a visit. Getting there: Take a boat to Wat Arun, then walk to hop in the boat at Pier 4 and cross the river to Wat Pho. 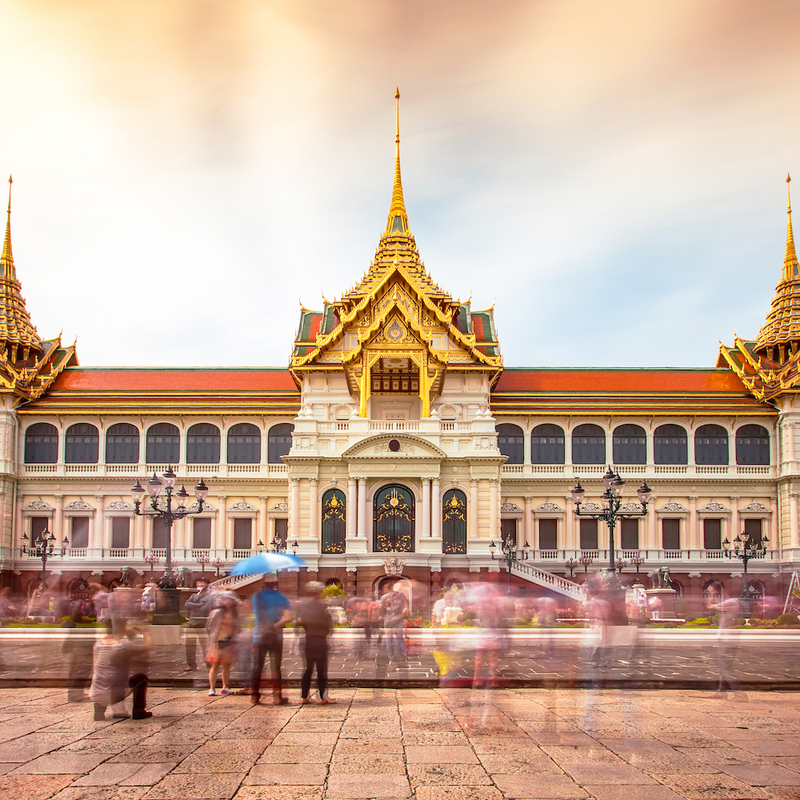 The Grand Palace is Bangkok's most famous landmark, known for its beauty and rich history. 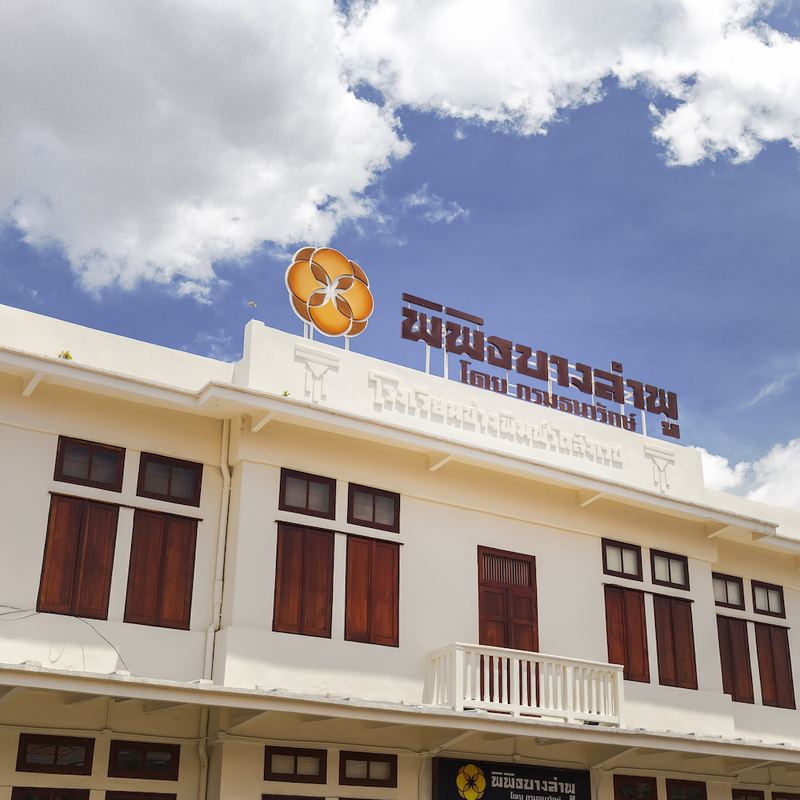 It has been the residence of many kings in the Ratanakosin period, from the reign of King Rama I until the reign of King Rama 5. Under King Rama I the construction of this royal palace was begun in 1782. Wat Phra Kaew, or The Temple of the Emerald Buddha, was built simultaneously with the Grand Palace. It is a major tourist attraction of the country and also known for its magnificent beauty. Inside beholds the Emerald Buddha statue, the priceless and precious symbol of Thailand. Open - Closed: The Grand Palace is open daily from 8.30 am - 4.30 pm (The ticket office closes at 3.30 pm). Admission: 500 baht each, including tickets to the Pavilion of Regalia, Royal Decorations and Coins, and Ananta Samakhom Throne Hall. Dress code: Please dress politely. Tourists who arrive dressed improperly have to change into clothes provided by the palace. This is one more very popular tourist attraction along the Chao Phraya River. There are a variety of restaurants from which to choose. You can also walk along and shop for chic products. Besides that, take in beautiful views from the 2nd floor of the structure, allowing a vast view of this well-known river. Suitable for photography as a souvenir, Maharaj Pier is also an access point to visit the Mahathat Temple; and the Grand Palace as well. Open daily from 10.00 - 22.00. เวลาเปิด-ปิดท่ามหาราช เปิดทุกวันตั้งแต่ 10.00 – 22.00 น. Watch the beauty of the barge in the ceremony of "The King of Thailand," which still holds the beauty and craftsmanship of the boat, all making it very valuable. There are 8 ships in the ceremony, each carved and gilded, completely decorated with gold and glass, especially the Royal Suphannahong (honored as a national heritage). The Department of Fine Arts has registered various boats to be national heritages; and they raised the shipyard to become The National Museum of Royal Barges in 1974. Open daily from 9.00 am - 5.00 pm. Admission: Thais 20 baht, foreigners 100 baht. Call 02-424-0004. Nightlife for those who love bright lights. One of the most popular tourist destinations. There are many kinds of street food that are sold throughout the whole route, including Pad Thai, Fried Bugs, Barbecue, Tom Yum Kung, Pad Ka Pao, etc. Here it's easy to fill your belly with several different tastes in one spot. Or it's fun to simply sit and drink. Various music is played from many shops. 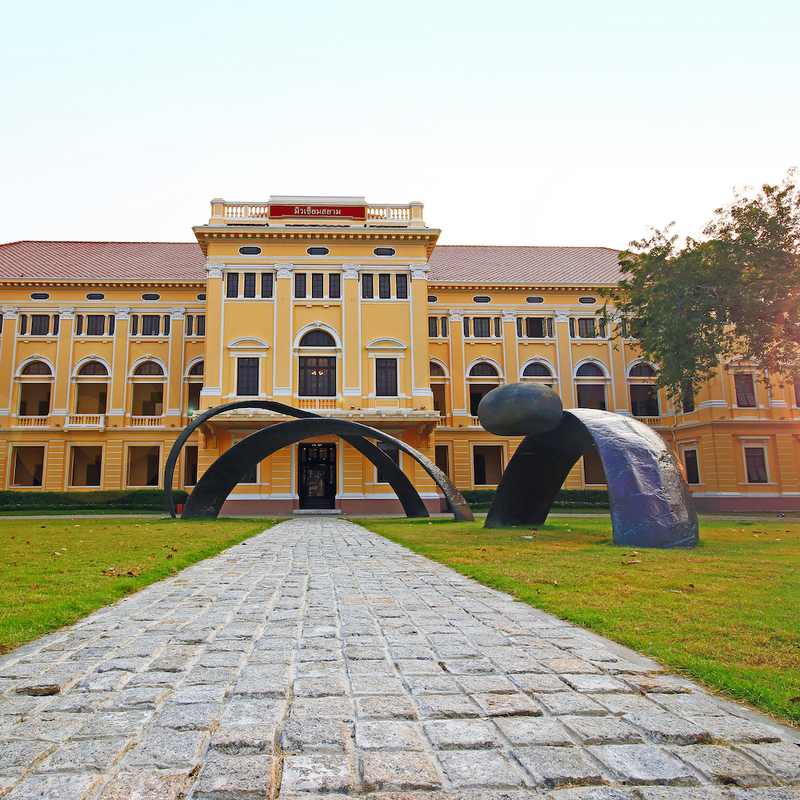 With a variety of accommodation, Khaosan is also a great place to unpack and spend the night. This place is a source of knowledge about the life, culture, traditions, wisdom and religion of Thailand; it applies, and displays objects and teaches historical narratives to recreate the traditional Banglumphu lifestyle. Its "Universal Design" is one meant to allow children, the elderly and the disabled, to visit without restriction. เปิดวันอังคาร-วันอาทิตย์ ,เข้าชมฟรี ตั้งแต่ 10.00 – 18.00 น.